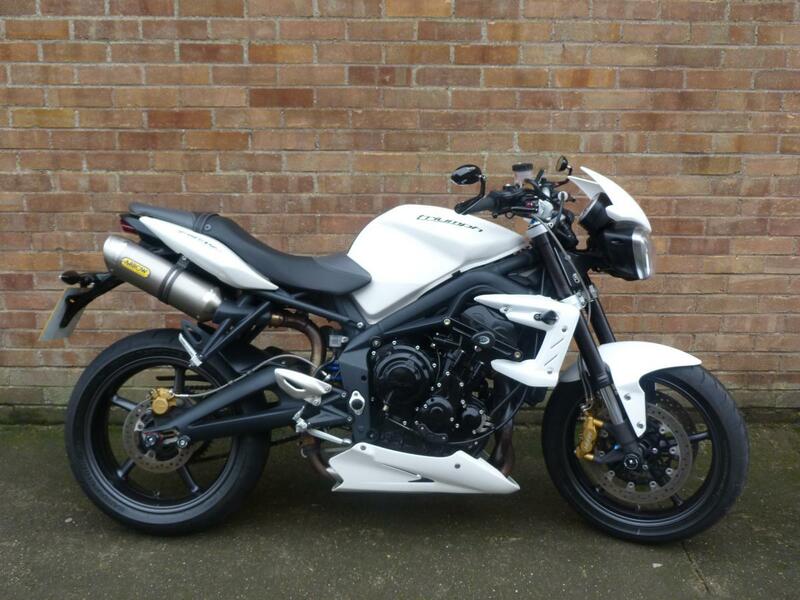 Here for sale is a 2012 12-plate Triumph Street Triple "R" 675 with 16,882 miles on the clock. This Immaculate Condition 675 R has been very well looked after and has a Full Service History. The previous keeper has fitted the bike with some very nice extras like a set of Arrow cans, Genuine Triumph Pazzo style levers and bar end mirrors, Carbon tank pad, heated grips, radiator guard and many R&G crash protection products. The benefit of buying at Ireland's is that each bike comes fully serviced and prepared by our fully trained technicians, it comes covered by a minimum 3 months warranty if no manufacturers warranty remains and will have 12 months MOT. Delivery can be arranged separately anywhere in the UK. Finance available through Black Horse finance and MotoNovo finance. Ireland's Motorcycles are a family run business established in 1971. Currently has 2 generations working together giving a friendly and welcoming feeling.